The GoPro HD Hero2 is an action sports stills and video camera housed in a tough case designed to be mounted on pretty much anything: head, chest, surfboard, car and even the odd balloon flight to the edge of space. The camera itself is a simple grey box containing a lot of technology for fast video processing. The 11 megapixel 1/2.3-inch sensor captures video in resolutions from 720p HD (1280 x 720 pixels) at 30 or 60 frames per second to 1080p (1920 x 1089) at 30 frames per second in NTSC. The camera also records in PAL at 25 and 100 fps. Drop the resolution down to WVGA (848 x 480 pixels) and you can record up to 120 fps, perfect for super slow motion. 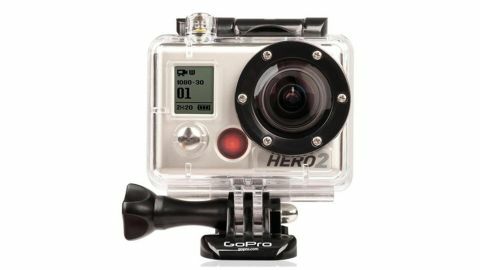 It's the ability to capture high quality video when the camera's being tossed and tumbled that makes the GoPro HD Hero2: Outdoor Edition great, with the f/2.8 fixed focus lens providing up to 170 degrees field of view to capture the action going on around it. There are a number of still image options available, too. If your memory card is getting full you can drop the resolution to down 8 or 5 megapixels. If you have plenty of memory and a Class 10 SD card you can set the camera to record in time-lapse mode at intervals from 0.5 to 60 seconds, although you'll need separate software to combine these stills into a movie. Another advantage of all that processing power for video is to boost the frame rate when capturing stills, giving it a burst mode rate of a respectable 10 images in a second, at 11 megapixels each. All this processing technology is protected from the elements by a hard plastic case with interchangeable rear doors. Some rear doors have vents to enable sound to reach the internal mono microphone, while others make the unit watertight or, in the case of the Floaty Backdoor, provide buoyancy aid for times when you want to make extra sure that your camera doesn't end up at the bottom of the sea. Shooting, even with the camera in its case, is straightforward. There's a button on the front for switching between operating modes and tweaking settings and a button on the top for taking pictures. The spring-loaded buttons on the case need a good press to operate them, but this also means there's decent protection from accidentally switching off the camera at the crucial moment. While the GoPro HD Hero2: Outdoor Edition doesn't have manual controls for exposure adjustments, it does an impressive job of adapting to changing light conditions, with an option to turn on spot metering when you're filming the outside world from inside a dark car, for example. Using it on a bike ride going from dappled light to bright sunlight, it adjusted exposure very well. Taking it into a dimly lit tunnel, the limitations of the sensor were apparent, producing an expectedly noisy picture - but it did fare better than some equally priced compact cameras. With the camera in its waterproof housing it's ideal for surfing, with the surf mount kit. The only thing that caught us out when taking photos while splashing about in the sea was having water droplets obscuring the view, something you'd only notice with a viewfinder. Also, a word of caution if you want to go snorkelling or diving: you'll need to grab the Dive Housing case, which comes with a flat glass lens designed to shoot underwater. If you use the regular case you'll get blurry images, since it's designed for operating above the waves. At 222g (that's the weight of three eggs) including the optional vented helmet strap, it's not too heavy to attach to a cycle helmet, although you do get a few odd looks, since it's not particularly inconspicuous. It copes with a rough canal path on a road bike with no suspension very well, producing surprisingly smooth footage. Out on a run with the chest mount, the footage is expectedly jerky, but free from missed or torn frames, and is a testament to the sturdiness of the construction. Perhaps to keep costs and weight down, there's no LCD monitor included - it's available as an optional extra. So there's a fair bit of guess work in lining up shots. Fortunately, the wide-angle lens captures more than you'd think possible due to the size of it, but it's a worthwhile investment if you want to be sure you're shooting the intended subject correctly. The LCD screen plugs into the rear of the camera, which is also used if you want to hook up another GoPro HD Hero2 to shoot 3D with the optional 3D Hero System. Other connections on the side of the camera include USB, a mini HDMI port, composite video port and stereo microphone input. The camera has four LED lights, one on each main face. So it doesn't matter which orientation it's in, you know when it's on. There's also a loud beep that can be clearly heard through the case. Both these options can be adjusted as well, for more stealthy operation.